You might think they're crazy, but it looks as though The Cars are reuniting after a split of 23 years. At least they're hinting at something to that effect. 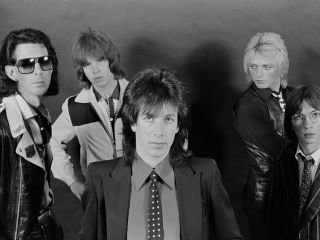 Recently, on their official Facebook page, the band posted a photograph of the surviving members - singer-songwriter Ric Ocasek, keyboardist Greg Hawkes, drummer David Robinson and guitarist Elliot Easton - gathered together in a messy studio surrounded by their instruments. MusicRadar contacted Easton, who declined to offer any definitive answers. "We're really not talking to the press," he said. Similarly, Hawkes (pictured playing bass in the Facebook photo), when asked by the Boston Globe whether the group was reuniting, said, "I hate to be vague, but I really can't say." He then added, somewhat tellingly: "It's a crazy world." However, if the band is trying to keep a lid on things, they're doing so with a nod and a wink. A link on the band's Facebook to a story about the reunion rumors is accompanied with the following note: "Anyone in the mood for a reunion by the Cars?" Hmmm, not too subtle. Since the band's breakup, Ocasek has become a mega-successful producer for acts such as Weezer and No Doubt. Easton, for a time, played with the John Fogerty-less Creedence Clearwater Revisited. In 2005 he and Hawkes recruited Todd Rundgren for what they called The New Cars, but that project stalled two years later.